This chart from the BBC. Some revealing and counterintuitive information. Three other countries that leap out here are Algeria, Morocco, and Libya. 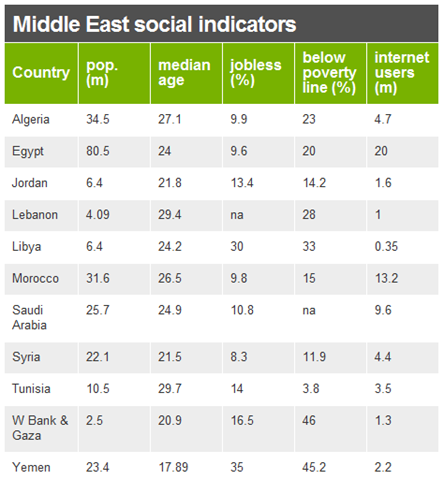 However it is also interesting that Libya is the lowest in internet users. Does this mean they will be less likely to resist Ghadafi? For that matter as pointed out today by Roubini in a piece in the FT we do need to be careful in what is wished for. He notes the history of populous uprisings to date within the middle east has almost always resulted in greater Muslim extremist views and not the hoped for secular and populous government, that Egyptians seem to genuinely desire. Think Iran, Lebanon, Gaza and to a lesser extent the shifts within Turkey over the last 2 years away from secularism. All the more reason for the US and Europe to get further ahead in terms of pressure to move Egypt to a realistic transitional government as quickly as possible. The Fortnightly Review › From Tunisia to Egypt: The digital dominoes of Araby.